Most folks have heard the folklore of No Bananas on a fishing vessel. Sometimes I will ask if anyone has bananas, but other times I forget and a banana will be in someone's bag. This time John had one in his bag and the contraband went unnoticed. The contraband would go unnoticed by the fish on this day as well. John came in from Wisconsin and traveled with Alex from Nashville. After having to back track because of a wreck, pulling the boat through a busy Walmart parking lot and quite possibly exceeding a speed limit here and there, I pulled into the ramp at practically the exact time as John and Alex arrived. It wasn't long before the rods were rigged with nymphs and the boat was pushed off the trailer and into the flow of the water. We loaded everything else into the boat and turned to push toward productive water. Alex offered up the front brace and John challenged the offer. But Alex insisted and, well, John took the front brace with a grin. Sometimes productive water is within the reach of a short cast. Before the boat hit the slow current John made a quick cast from the front brace. Within 10 seconds of shoving off, he would bring the first fish to the net. The banana was still buried deep within the bag and still going unnoticed. The fish were apparently waiting on the angler in the front brace to cast and when opportunity met the good presentation they would eat. John was quick to set the hook and the fish continued coming to the net with some regularity. Alex was warming up from the rear brace and the fish began to respond to him as well. John, however was well ahead in the numbers game. We would fish and re-fish sections with good results in each stretch. On one of our short breaks John pulled out the banana... A hush came over the boat...OK not really. We had a short discussion concerning the tales of old sailors and the fear of bananas on a fishing vessel. The banana would be consumed and shortly the guys would begin picking up slightly better fish. Additional passes through the more productive areas would give us opportunity to spot better cover. But, the trip for John and Alex was coming to an end. There would be two more fish. The two best fish of the day would come at the end of the float. John and Alex would bring their best fish to the net on their last casts and one then the other would hook the fly to the keeper and reel up the line, ending their day. Ryan, Adam and Skane Get on the River. Ryan and Adam came to Tennessee to attend an early Ford Bronco show. After spending a couple days at the show the next move on their swing through Tennessee was to stop along the way and get aboard the drift boat. They traveled from Michigan, where they experience some good fishing, but we would put some nice fish in the boat on higher water. Some of our high water experiences from early in the year would pay-off on this trip. So with the guys in their places and Skane patrolling the boat we shoved off and began to get the right stuff on the right rods. We were two minutes into the float and Adam had the first fish in the net. It wouldn't be long before Ryan got his first fish from the back of the boat...then another and another and another, and the bite was on. The browns were out and playing early. The normal stocker browns were out but so were some nicer fish that put up a healthy fight for their size. The fins are looking good and some of the fish are getting a little more broad across their shoulders. With the off-color water we are hoping some will holdover and not fall prey to the stringers. Fishing wasn't all rainbows and unicorns on this day but the guys kept digging and the fish would come to the boat in all the usual places. Ryan was taking his shots from the back of the boat and after bringing up his catch-rate early in the float he set the hook on something that pulled right back. He fought the fish like a pro. The fish took us around the river a couple different times. But, the brown couldn't pull out a trick that Ryan didn't know. Finally the fish came to the net and we had "one happy boat". We took the appropriate shots and turned this one loose for someone (hopefully us) to catch again. Spring appears to be here in Middle, Tennessee.The trees and flowers as well as the shrubs are blooming. The fishing continues to pick up and we are lucky enough to put anglers on some good fishing. Ryan and Adam it was a good day on the water and I have to say the day flew by. See you next time you come through Middle, Tennessee... and save some fish in Michigan for my next trip to the Great Lakes state. We started the day nymphing under indicators along with a dry-dropper combo. Both of the rigs caught fish and the nymphs won the day....again. The guys put in their time in the upper reaches of the river with good casts and technical presentations. The water is slow moving right now, so an almost perfect presentation is the best way to get some takers. Anthony was fishing close to structure, within a few feet anyway, and threw a good mend in the line. When the fly settled and began a solid drift the fish apparently could not resist. The dry took dive and Anthony came tight on the fish. Anthony's hook set was nothing short of spectacular...at least to us anyway. The fish probably didn't have the same opinion, but when the hook found its mark that's when true fight began. Anthony played the fish well, getting in front of it most of the time. Finally the fish came to the top and Anthony slipped the fish into the waiting net. Anthony scored the best fish of the day on that cast and I'm not sure if Greg could have been happier. Greg had watched his son catch that nice rainbow and wanted one of his own. Some time passed as we continued offering the flies of choice. Changing depth when the river dictated was important. The lower flows made that chore a little easier, but none the less critical at times. The drifter floated into a productive stretch. Over the past few floats we have been able pick up some better fish on this particular stretch. Greg set the hook from the back of the boat and the fish began dig. It wasn't a huge fish, but it had some staying power. Greg is a seasoned angler and he stayed with the rainbow. It wasn't long before he too had the head up and was slipping his rainbow into the net. The guys were into double digits quickly on this float and continued to bank good numbers of fish in each stretch. The fishing was productive on nymphs and again being ready to adjust depth was just the second piece of the puzzle. So that's the fishing part... Another reason we were on the water is because being on the river with family is a good way to get quality time. This float was about father - son time. A little friendly family competition set the stage for turned into a really nice day on the river. Spring in the casting braces is a good way to forget about the problems of everyday life and just focus on the family and, naturally, the fishing. Two friends who met in grade school are moving through life on parallel tracks. This was their first day off after becoming first time moms...translation...they left the kids at home, which is not that easy They left the husbands at home, which is probably a lot easier than leaving the kids at home and they went on an adventure. What would they do on their day off? Well, fly fish of course. So thanks to clear skies and modern technology we met up, then began the float. We started with some casting practice, a few mending tips that would come into play later in our float and for all our troubles there were a couple early fish in the net. Mary began by setting the hook on the first few fish. Laura was getting some serious distance with her casts and clean drifts, but her numbers would have to wait. The river was as off color as it has been all year, so the fly had to be placed right in the feeding lanes...like they have needed to be placed all year. 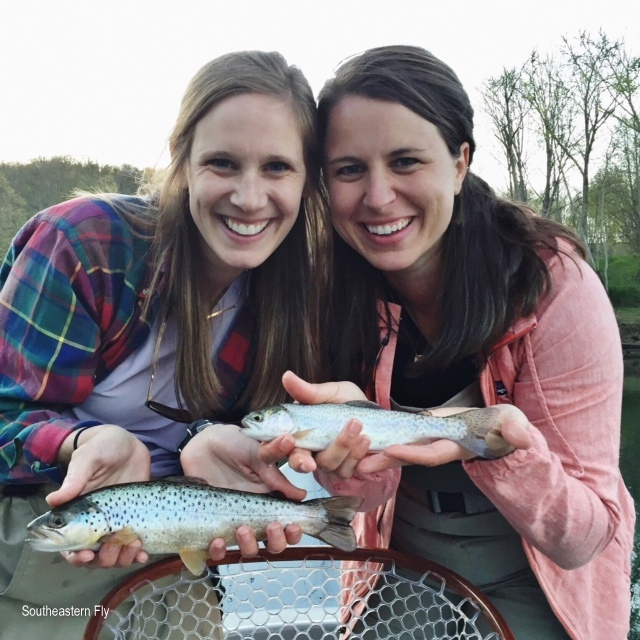 Laura and Mary were in a casting groove and when they dialed-in their presentation the fish responded. The fish were mostly in the usual places, but we were still having hot and cold spells in the results column. 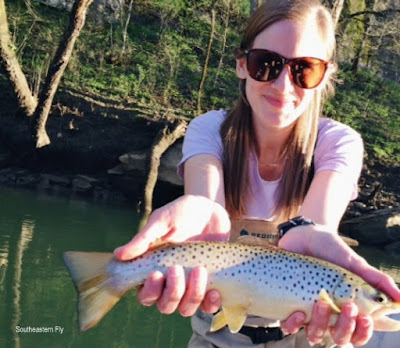 Laura was placing that dry-dropper in all the right places and the fish finally began to fire with moire consistency when everything was just right. Those first several fish were just a warm-up for what was to come. With Mary in the front brace and Laura in the rear brace we were beginning to show some better and better results. A couple hero shots later and the oar blades were dipping just below the surface to began pushing water to the next stop. That next stop was jam-packed with slow and painful drifts. After dismal somewhat poor results the announcement came that it was time to move on to another likely spot. Mary had just thrown one of her best casts of the day and was getting all the presentation out of that cast that she could possibly get. In other words she wasn't giving up on that drift quite yet. Then it happened. Mary set the hook and felt a good pull back. This was a different type of fight and she realized it right away. The fish took us for a short ride around the middle of the river. Mary played the fish just right and with words of sarcasm encouragement from the rower's bench as well as the rear casting brace, Mary took the fish through its paces. Then just like that, Mary's first brown of the float was in her hands. Not too long after Mary brought that brown to the net, Laura would have a very similar experience,including "words of encouragement", with her best brown of the day. This day was getting "pic heavy". Now, I have to say the day wasn't all rainbows and unicorns but we sure were seeing a fair number of good fish coming to the big Brodin net. It seemed like there should be at least one more really nice fish coming our way. We spotted a feeding fish and everyone began to refocus. Mary was in the front brace and dropped her fly just a few feet above the feeding rainbow. The fish ate, Mary set the hook and the fight picked up speed immediately. Everything began to happen at warp speed with this fish. Mary temporarily lost her composure but gained it right back, she stood up straight and began to give the rainbow a few lessons in proper fish-fighting. This rainbow was similar to the other rainbow that took us for a ride. This fish was in skinny water so it wasn't hard to get to the bottom of the river and start going for the rocks. That's exactly what the fish did. Mary did an outstanding job with the fish and toward the end she had it on the reel for the final game of give-n-take. After that last bit of tricks from the fish we had the it in the net. Then it was time for a good pic and a recap of those most recent events. So after they started the day with casting then mending, followed by hook sets and proper fish fighting, the ladies moved onto chocolate and good stories Those stories were of past, present and future. We were ahead of most boats and all of us headed to the final gravel bar. So how does a good day end? They had a short discussion and decided a double would be a good end to the day. Then they stepped up to the casting braces and in the final yards they checked the box on a double. That double would be their last cast of the day. We stowed the rods and the oars began to dip just under the surface for one more series of strokes and those strokes would push us to the take out. The drifter carried us to the gravel bar just ahead of the rest of the fleet. Soon everyone at the gravel bar was comparing notes. There was no doubt these two friends who met in grade school are moving through life on parallel tracks and they shared an outstanding day on the river.. Some big storms were rolling through Middle Tennessee the evening before our float. Those same storms continued into the night and into the early morning hours. Just under 4" of rain fell and when the trip to the river was slowed for downed trees and muddy highways it was obvious, even to the most optimistic angler, we would need a new plan. Howard and his granddaughter Martha arrived short time after I arrived at the ramp and we made our game plan for the day. With a visible mud line moving into the upper reaches of the river we decided to travel in search of clear water. A short time later we were driving...while Martha one of us slept. And thus the adventure began. It wasn't long before the shuttle was arranged and the rigs were changed for different water. Martha took a few warm-up casts and immediately proved Howard had worked with her, as he has with each grandchild he has brought on the boat. His pre-float work made an easier day for the guy in the rowers seat. They picked their casting braces and then we slipped away from the gravel to begin the float. We put the flies in the feeding lanes and the fish began to respond. The water clarity was about 2' so we were having moments of greatness and moments of just floating. Martha made herself comfortable and was still picking up fish. Howard was standing in the back brace but Martha's presentation seemed to be the way to go...at least early in the float. We fished dry-dropper rigs and at lunch time we found some feeding fish. Howard stepped up to the brace, stripped off some line, put the fly right at the edge of a drop-off and bang the fish ate. We both really enjoy seeing fish come up for the latest and greatest fly, this part of the day those fish didn't disappoint. Score one for the good guys. The day went along with Martha picking up fish and Howard batting clean up from the rear brace. Traffic on the river was light and we were able to pick some good spots most of the day. With the late release of water we eventually we were chasing daylight to the ramp. The day was coming to a close and we had a few more stops along the way with some more tricks up our sleeve. Howard was on the long rod and Martha at the net, we were finding fish and making some memories.